I had been wanting to make minestrone soup for a while when I came across this version which looked really good. 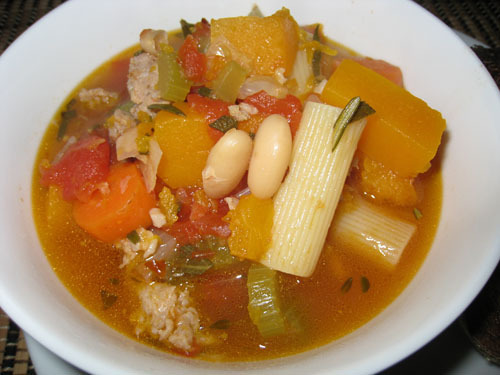 This minestrone soup included sausage, squash and a ton of fresh herbs. I knew that I would use spicy Italian sausage and I though that the sweet butternut squash would go nicely with the sausage. The minestrone soup turned out really good! It was full of flavour and super tasty. The spicy Italian sausage and the red pepper flakes gave the soup a nice heat. I enjoyed the ministrone soup with this cheesy garlic toast. Brown the Italian sausage in a large stock pot and set aside. Add the carrots and celery and saute until tender, about 3-5 minutes. Add the stock, tomatoes, cannelloni beans, squash, rosemary, thyme, sage, bay leaves, red pepper flakes, parmigiano reggiano rind. salt and pepper and simmer for 20 minutes. Cook the rigatoni while the soup is simmering. Add the rigatoni and parsley and turn off the heat. That looks yummy! I am home sick today and wish I had some of that! Kevin, give me a big bowl of your Minestrone and call it dinner. This looks like a perfect winter supper. Add garlic toast and I’d be in heaven. Hi Kevin! Happy 2008! How you keep up your blog is just amazing. I started a new job in October and the energy it has consumed took time away from my blog. But I hope to start posting again very soon! I do hope all is well with you and I look forward to reading more about your cooking adventures. This looks perfect for the cold weather. I love that rigatoni sticking out there. Nice and al dente. I like that the pasta and sausage adds bulk, and makes it really filling. Minestrone is such a soothing soup; one I haven’t made in a long while. Yum, sausage and squash are great together! I’m with Jenn – sausage and squash are a really great combination. Your soup looks yumlicious! Minestrone – my fav western soup! Great dish, thanks so much for sharing with PResto Pasta Nights. This is one perfect dish for the current weather here in Halifax….bone chilling cold! This soup is amazing. I make it all the time. Thank you.